US Congressmen Scott Tipton and David McKinley lift an olive branch on the Temple Mount and find themselves detained by police. US Congressmen Scott Tipton (R-Co) and Congressman David B. McKinley (R-WV) were detained Thursday morning by Israeli police after they lifted an olive branch on the Temple Mount. Tipton and McKinly are currently on a fact-finding mission to Israel sponsored by Proclaiming Justice to the Nations and facilitated on the ground by Jaffe Strategies. Their mission emphasizes US-Israel cooperation on security issues and appropriations measures. During their trip, the two will meet with top US officials in Israel to discuss strategic and technical ramifications of the US recognition of Jerusalem as capital of Israel. According to the Jewish Press, Tipton and McKinley had ascended the Temple Mount accompanied by Israeli police officers and a Waqf guard. After lifting the olive branch, the congressmen were physically removed from the Temple Mount and informed that they would be detained, despite their upcoming meeting with Israeli Prime Minister Binyamin Netanyahu. The Jerusalem Waqf, subordinate to the Jordanian Waqf (the term for Islamic trust,ed.) controls the Temple Mount and forbids visitors who are not Muslim from praying there. The slightest movement or utterance made by visitors is suspect and leads to detaihment by Israeli police, whose orders are to follow the dictates of the Wakf..
After their release, Tipton and McKinley met with Netanyahu, noting their experiences. Responding to the incident, Im Tirtzu's Policy Director Alon Schvartzer said, "The situation on the Temple Mount has reached a new low. This is a disgraceful reality that has long crossed the point of absurdity, and we cannot allow it to continue." 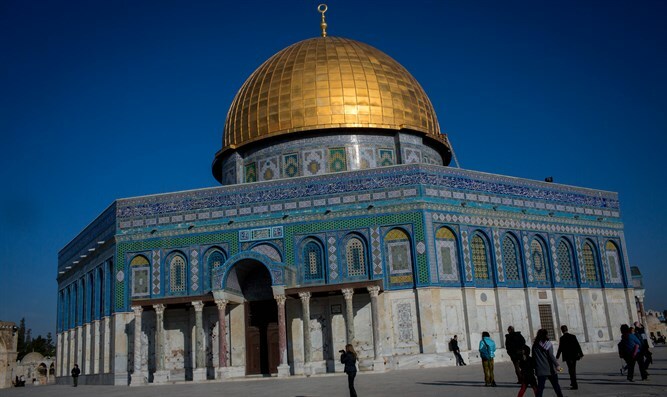 "Israel must remember that it has sovereignty over the Temple Mount, and not the Waqf. The time has come to provide freedom of worship to Jews, Christians and all those who wish to worship peacefully on the Temple Mount.""